The development of hydropower manifests the conflict. Electrification and energy development have long been a critical issue for the nation in transition. Nowadays, only about one third of the Burmese population has access to electricity. Myanmar currently relies on domestic hydropower – totaling a little over 4,000 MW - for over 70% of its electricity. However, in sharp contrast, a presentation given by Myanmar’s Hydropower Department head in early 2015 mentioned that there are 302 hydropower projects under development in the whole country with a theoretical installed capacity of 46,330 MW, whereas a World Bank report puts Myanmar’s hydropower potential to be up to a whopping 100,000 MW. Partly due to the country’s underdeveloped national grid and lack of financial means, most of the planned hydro-projects are primarily invested by foreign corporations and were originally envisioned to export most of their electricity to either Thailand or China for foreign exchange. However, this scenario is likely to change in the future, not least with the economic downturn in China and the overcapacity from China’s domestic hydropower stations in its southern provinces. Myanmar’s evolving legal and contractual frameworks for its energy projects also present very different risk and benefit-sharing implications amongst various stakeholders when comparing to its neighboring countries such as Laos or Cambodia. For instance, Myanmar's current hydropower contracts are normally based on an agreement between government and public or private companies, with the requirement of 10-15% free share taken by the national government and the rest goes to the investors. While foreign observers have called this type of contracts made during the military regime “unequal, ill-advised and unfair” and need to be scrapped, Chinese investors are also expressing concerns over the lack of stake shared on the part of the Burmese government due to the condition of “free share”. While Myanmar’s economic growth, urbanization, and industrialization all require massive electrification, the lack of transparency in hydropower governance, coupled with lack of incentives and good will for all stakeholders to agree on protocols and safeguards which are vital to the implementation and monitoring such projects, have resulted in a gridlock among various players. Despite recent changes to policy, laws, and governance structures, the planning and development of large-scale hydropower projects have forged ahead with what civil society actors claim to be inadequate notification or consultation with the affected communities. In the meantime, community and civil society groups continue to struggle to monitor and shape an industry dominated by some of the world’s largest and most influential multi-national corporations. With political power transition from Union Solidarity and Development Party to National League for Democracy (NLD)-led government, the fate of Myanmar’s planned hydropower projects – including the ones on the Salween river which are currently met with intense opposition from a transnational network of ethnic civil society organizations and environmental activists - again become the front and center subject of public debate. Many observers, for instance, see the handling on Myanmar’s energy and extractive policy a test case as for whether the new government will be able to right the wrongs from the previous military government. Despite a renewed urge from the Chinese side to restart the controversial Myitsone project, the NLD-led government seems to be more concerned with retaining its own political capital rather than with repairing the straining relationship with China. For instance, a NLD spokesperson has recently vowed that the new government would re-examine the project contracts and listen to the public concerns. With the power transition and a new president taking the office, local and transnational activists are also seeking opportunities to make their voices heard by the new cabinet. My fellowship research is premised upon the belief that the rapid unraveling of ambitious hydropower development plan for Myanmar and the entrenched disagreement among the stakeholders makes now a critical juncture to map out the disparate perspectives, and to identify knowledge and communication gaps amongst the stakeholders at community, corporate and policy-level. Through semi-structured key-informant interviews with selected representatives from affected communities, civil society organizations, corporations, financial and policy sector from Myanmar, China and Thailand involved in the Mong Ton project (formerly Tasang project) - one of the largest and arguably most controversial large-scale hydropower dams under development on the Salween river - I try to gain more insight into the power dynamics among those players and how were their perceptions of and past experiences in dealing each other? How will this relationship condition corporate sector’s perception of, and reactiveness to, the set of regulations and legal principles regarding social and environmental safeguards? What are the gaps and opportunities for various stakeholders to engage with each other? What type of issue-framing – be it social justice, investment risk, corporate social responsibility or something else - have been most effectively employed to positively influence corporate stakeholders’ evolving social and environmental responsibility standards? What are the key drivers and avenues to effect deliberative engagement in hydropower governance complex in the Salween River basin? What could the civil society do better? 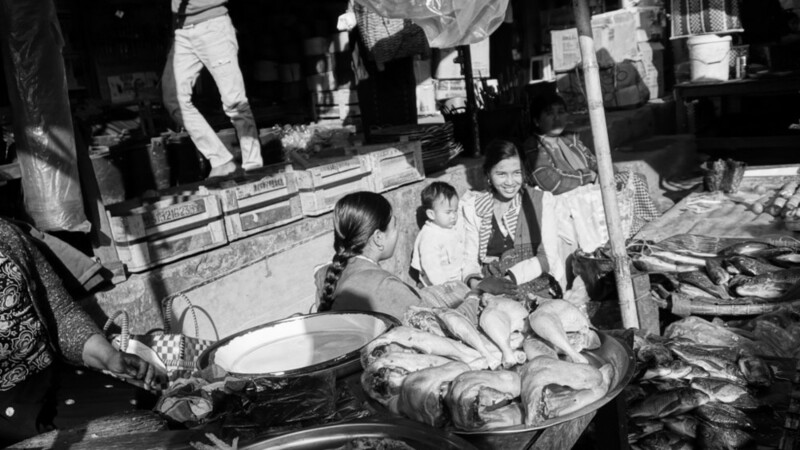 Market scene in Taunggyi, one of the major entrepôts near the Thalwin-Salween river. Despite the emergent promise of more responsive governance from the new government, there are still no formalized processes for public consultation in relation to these large-scale projects and any consideration of community or civil society concerns remains subject to ad hoc and arbitrary decision-making. Furthermore, the community and civil society actors still see the planning processes for the series of hydropower dams on the Salween River essentially unchanged despite widely-publicized social and environmental concerns. In early 2016, when I had the opportunity to attend a CSO-organized consultation with the local communities close to one of the upcoming Salween dams, community members mentioned to me that they see profit sharing (concern that Myanmar only gets 10% of the revenue and the community will get next to zero) and accountability (who will be responsible for the likely abuses) to be among the top of their concerns. Partly due to the harrowing history associated with large-scale infrastructural projects in the contested areas, where state military forces have systematically displaced and dispossessed hundreds of thousands of civilians from their lands, homes and livelihoods during the past three decades, there were also widely-shared concerns that the militarization and conflicts, forced relocation and land confiscation, as well as the social and environmental impacts will not be adequately identified and mitigated. At the consultation meeting I was also told that when an international consulting firm hired by the hydropower developers came to their villages to conduct Environmental and Social Impact Assessment (ESIA) studies, the community asked the same question about profit sharing but did not receive a response— instead, the consultants only talked about the benefits of the project (roads, jobs, etc. ), and didn’t talk about any of the negative impacts. The same consulting firm that attempted to hold consultations last year with affected communities in Shan state garnered a lot of criticism from local activists who claimed that the company carried out the studies in a manner that was not consistent with international standards, and did not do enough to inform villagers about the potentially huge impact the dam would have on their livelihoods and the local environment. Even though many community members still have deeply-ingrained fear from past oppression – one can tell from the elders telling the younger generation not to attend consultation– still many turned up and voiced their concerns and even opposition. It was also interesting to observe the divergent levels of awareness and the languages articulated by different groups when it comes to the issue of hydropower governance. During the civil society-organized consultation while community members were pressing for more project–specific information – which they find to be chronically challenging to obtain - local CSOs were specifically asking for literature about international law and Thai/Chinese investment law and Myanmar law that they can use to hold project investors accountable, indicating a quite advanced level of familiarity with the issue of corporate accountability and advocacy strategies. Despite, or perhaps as the result of, the absence of local activism which was effectively subdued during the previous military regime, at the regional level there has been a burgeoning network of transnational network of environmental and human rights activist. On issues related to the hydropower development on the Salween, a strong coalition of community members and environmental activists from Shan, Karen, Karenni, Mon, and other ethnic groups have also recently emerged. So far, the civil society coalitions are categorically rejecting the mega-dams on the Salween, making it difficult to any large-scale project to pull through without intense scrutiny and local resistance. Anyone who follow stories on the hydropower development in Myanmar would be familiar with the well-documented opposition from the civil society groups. However, the perspectives from the private sector players – namely project developers, financiers and consulting firms – are mostly out of the sight from the general public. From my previous interviews with individuals from or close to the hydropower sector, Chinese hydropower companies who invest in Southeast Asia often find little incentive to do more than what is legally required when it comes to the social and environmental performances of their projects. Additionally, they often claim that they, too, are victims of the lack of accountability and transparency of their local business partners. Facing criticisms from the civil society groups, they have often chosen not to respond publicly, claiming that NGOs are inherently motivated to spread “rumors” and oppose to the projects no matter how much efforts are made from the part of the company. However, patterns of corporate’s response to civil society concerns are also changing due to the rapidly shifting political and social context in Myanmar. The suspension of the Chinese-developed Myitsone dam under the Thein Sein government, for instance, sent shock waves among investors inside China. While conspiracy theories abound in China in explaining the events that lead to the fateful halt of the high-profile project, to many policy and industry players it was a wake-up call to the substantial political and financial risks of large-scale overseas infrastructural projects invested by Chinese State-owned enterprises (SOEs). As a result, many hydropower developers have been revising their sustainability standards and practices. The China Three Gorges Corporation, the biggest shareholder of the Mong Ton project, for instance, has been in discussion of joining the Hydropower Sustainability Assessment Protocol to mitigate the environmental and social impacts. The Hydropower Sustainability Assessment Protocol, of which many community and civil society actors tend to write off as a “pro-dam” scheme, do actually contain provisions to conduct proper ex-ante impact assessment and mitigation and stipulate proper consultation with affected community over potential risks. On the side of China’s government, the Ministry of Commerce has also been developing a way to encourage Chinese companies to implement better projects even when the legal requirements in host countries are quite low. Meanwhile, the concept of “social license to operate” has been painstakingly, if slowly, promoted by Chinese and international groups who advocate that companies should go beyond its usual “corporate social responsibility” approach. They argue that the companies should not merely channel millions into building roads, schools and clinics that usually do not get recognized – but to premise their business strategies on local community's acceptance or approval of a company's project or ongoing presence in an area. Despite the slowly changing business approaches, from the prospective of hydropower developers investing in Myanmar, the current stalemate does not provide an easy option to those investors (mostly Chinese and Thai) who have already invested – since the early 90s - significant amount of funds during the project planning stage, often through corrupted officials and cronies. What would be a viable exit strategy for the companies who have already invested hundreds of millions of dollars in those projects which translate into over 45,000 MW of committed generating capacity at varying stages of development? Inclusive hydropower governance in the Salween basin - missed or emerging opportunity? Recent steps towards economic reform in Myanmar have led to a surge of foreign investment directed towards intensiﬁed natural resource extraction. With the ongoing developments, some argue that Myanmar’s future is largely dependent on how its natural resources are managed and how the beneﬁts from the resource extraction are shared. The controversies surrounding such projects, at various stages of development, illustrate the vast chasm between the interests of governing elites and those of the local indigenous or ethnic minority communities in the river basin. Does the ongoing civil society campaigning on large-scale infrastructural projects actually making an impact? I tend to think so. The increasing campaigning and legal challenges brought forward by transnational activist networks over the lack of transparency, accountability and legal compliance certainly are generating much-needed pressure to influence corporate stakeholders’ evolving social and environmental responsibility standards. One may even liken it to the case of ‘civil regulation’ – that is, a series of codes of conduct for business set by the civil society actors instead of government or legislative bodies in countries with weak governance framework. However, given the incapacitating polarization over the issue of hydropower development and the rapidly changing political, social and regional contexts in Myanmar, I am of the opinion that it would be in the interest of both civil society and private sector actors to revisit their approaches and messages to each other, and to start striving for a more equitable and inclusive development model in the Salween river basin by seeking common ground and building mutual trust. To ensure that the grievances are evidence-based, proportionate and with a clearer sense of which actors are accountable. While most of the community-based organizations and NGOs (among which the objectives do not necessarily always align) usually speak from a rights-based and normative point of view, some arguments may need to be more carefully calibrated to make sure that they achieve the desired result (and would not backfire). To ensure equitable participation of community actors into the decision-making process of development projects, trust-building between civil society and corporate actors are a prerequisite. Pure pressure does not lead to accountability. Due to frequent misrecognition and lack of trust between company and civil society actors, knowing what type of the discourses that can more effectively register among the corporate players can often help getting the message cross. It would be wrong to look at hydroelectric development only through the lens of energy security and economic development. How the projects are approved and developed, and how the revenue benefits are distributed are as important as the electricity. It would be in the interest of the investors to heed the gap between the notion of corporate social responsibility (CSR) and accountability – while a company may spend as much as they like to demonstrate that they care about local livelihood and welfare, the social investment does not make the business accountable for the environmental and social impacts their activities brought forward in the first place. Localization and social license to operate should be integrated into the business strategies. For businesses who are concerned that their good intention does not translate into social acceptance, it would be beneficial to get a ground-level view of the impacts of its investments and build good relationship with local civil society actors to better identify and mitigate business risks.